The UIW Cardinal Jazz Band (MUEN 1182) (formerly the UIW Jazz Ensemble) performs professional level jazz repertoire that includes swing, funk, and latin. Ensemble membership is open to UIW students, faculty, and members of the community. 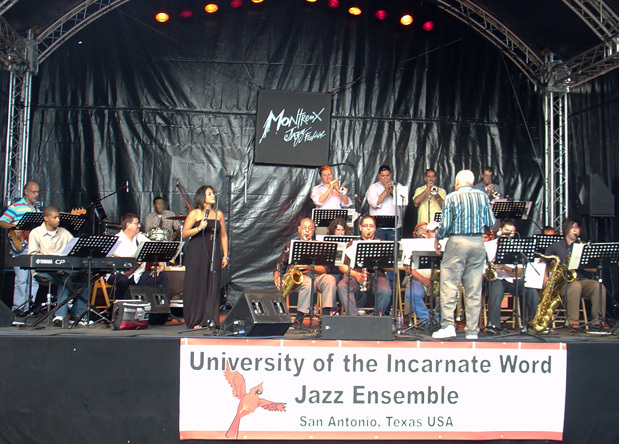 The Cardinal Jazz Band is currently the only college jazz ensemble from San Antonio to have performed at the famed Montreux Jazz Festival in Switzerland (Summer 2009). The ensemble also performs regularly at the Texas Jazz Festival in Corpus Christi, The St. Mary's Fiesta Jazz Festival, and at The Cove Restaurant on the last Wednesday of every month (during the school year). The ensemble's 2010 performance at the Texas Jazz Festival featured alto saxophonist Richie Cole (Buddy Rich, Doc Severinsen, Freddie Hubbard, Nancy Wilson, etc.). In 2012, the ensemble performed with famed guitarist Jackie King (Chet Baker, Ray Charles, Les Paul, etc. ), and May, 2013 the last on campus concert featured legendary jazz trombonist, Bill Watrous (Maynard Ferguson, Woody Herman, Quincy Jones, etc.). contact ensemble director, Jim Waller at (210) 445-0412 or jwaller@uiwtx.edu. Roger Hogan - lead tenor saxophone, professional, former member of U.S. Air Force "Airmen of Note"